While trying to incorporate new and healthier habits into your lifestyle, it’s always important to have food on hand that is satisfying and comforting. Soup is a great way to feel full — and for you to be full of nutrients, too. I love making this chicken soup because it simplifies my meals. Once I make a pot, I have something tasty at the ready and it’s freezeable, too. So if you live on your own, you can package up the extra for a future busy week. Or if you have a household full of hearty eaters, you’ll always have an easy-to-thaw lunch or dinner on hand. Try this simple but delicious chicken soup and make sure to freeze what you don’t eat in individual containers. If you live on your own, you can package up the extra for a future busy week. Or if you have a household full of hearty eaters, you’ll always have an easy-to-thaw lunch or dinner on hand. Start with two already roasted chickens. You can roast them yourself or purchase ones that have already been cooked. Take all the white meat chicken off the bone, chop to desired size chunks and set aside in a large bowl and discard bones (or save for a stock). In a large pot, heat up the broth and add the garlic, onion, carrots, salt, and pepper. If you have other vegetables on hand (parsnips, turnips, rutabaga, celery, etc. ), feel free to throw some in. When it begins to boil, turn flame to a simmer and add in the chicken. Divide into freezer containers for future meals or serve hot to your family! 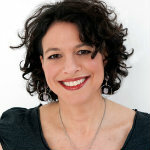 Alma is a Licensed Clinical Social Worker, cooking coach, and food blogger. She is the founder of Take Back the Kitchen, a lifestyle program created to help people recognize and overcome common and unique obstacles to planning and preparing healthy meals. Alma provides demonstrations, workshops, and speaking engagements for individuals and non-profits, as well as for corporate wellness workshops, lunch and learns, and company retreats. Alma has presented at TEDx and is the recipient of The American Red Cross award for Community Service. She has been featured on the Today Show, TV Land, CBS News and is a frequent contributor for CBS local.com, Diabetic Lifestyle, and Knowmore.tv. She has been featured in Family Circle Magazine, Family Fun Magazine, and numerous other websites and publications. Her syndicated recipe column appears in more than twenty print and online newspapers. Alma has been on the Whole Life Challenge for a year and a half and has never felt better.